WASHINGTON — President Donald Trump's path to re-election runs through an alternate voter universe. Rather than build from his base, like a traditional politician, Trump is trying to expand his base and make it a larger share of the overall electorate. The idea is for his campaign, which has begun to ramp up in recent weeks, to identify, keep in contact with, and mobilize a new set of pro-Trump voters who typically don't go to the polls. If it works, they will fundamentally change the so-called universe of voters, offsetting the loss of suburban Republicans at a time when his overall approval ratings remain far below the break-even point. "The successes of this presidency are fueling a groundswell of support and are bringing in new voters," said Kayleigh McEnany, national press secretary for the Trump campaign. That helps explain why Trump has been all about his base, even after a midterm election in which House Republicans were handed a resounding defeat and the GOP lost gubernatorial races in Midwestern battlegrounds that were key to his 2016 victory. It's an echo of his strategy the first time around, when his 2016 campaign pounded away to bring conservative non-voters to the polls in swing states. His team points to a February rally in El Paso, Texas, as a model for the president's outreach in 2020. 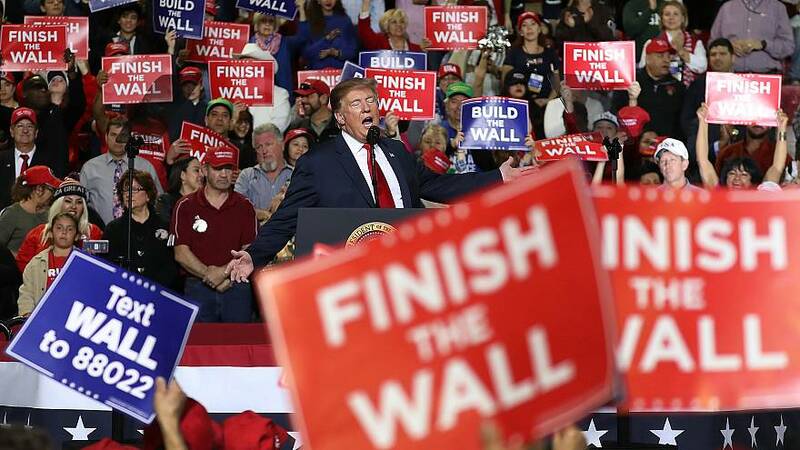 At that venue, where Trump promoted his signature border wall, nearly half of the attendees were people who had voted no more than once in the last four elections, including many registered Democrats, according to the campaign. "These are new voters that we intend to bring into the Trump coalition," McEnany said over e-mail. "Our data operation is unmatched in the history of American politics. We will identify a particular universe of both swing voters and low propensity voters based on voter score data and will use our historic army of volunteers to make contact with every voter necessary to ensure President Trump's re-election." "Voter score data" is the way the Trump campaign and its partner, the Republican National Committee, classify prospective voters based on their propensity of showing up to the polls, their issue interests and the likelihood that they will pull the lever for the president. Both parties use similar methods to identify targets for turnout and persuasion efforts, as well as modeling how candidates will perform in elections. One danger in using such data, political strategists have long warned, is that it can be misunderstood as an end rather than a tool for developing strategy and tactics. Another is the possibility that the underlying data aren't as precise as the campaigns would like them to be — or believe they are. And a third is that focusing intently on a candidate's existing supporters can lead a campaign to develop messages that alienate and energize voters outside the target groups who end up supporting the other side. MSNBC's Steve Kornacki wrote in an analysis for NBC News last week that Trump's approval ratings are virtually inelastic — that most Americans' views on the president aren't subject to change — which could lead to the conclusion that Trump's best shot at re-election is to find non-voters who agree with him and drive them to the polls. Kornacki approached the question of Trump's chances, which seem tough on one level because he's lost ground in polling in key Midwestern battlegrounds that he won in 2016, as a two-part problem for the president. "His victory came even though large majorities of voters didn't like him personally, didn't believe he had the temperament to be president and didn't think he was qualified for the job. Trump wouldn't be president unless at least some people who held all of these negative views of him voted for him anyway," Kornacki wrote. "To win re-election, he'll probably need this to happen again. Which means he'll need an opponent who, by Election Day, is as unpopular as Hillary Clinton was in November 2016." That's the other part of the equation for Trump: depress Democratic turnout by making that party's nominee unpalatable for the Republicans who abandoned the GOP in the midterms. Though he has made a sport of skewering his potential rivals — giving many of them derisive nicknames and attacking them both on social media and from the campaign trail — his campaign betrays little concern about who he'll face come next November. "It doesn't matter who emerges from the Democrat[ic] convention in 2020 because that candidate will be embattled, low on funds, without a national operation, and saddled with the socialist policy positions demanded by the extreme left of their party," McEnany said. "No matter who becomes the nominee, they will have the scourge of socialism attached — an ideology which has destroyed lives, wrecked economies, and eviscerated personal freedoms." And the specter of "socialism" cuts right to the worst fears suburban Republicans have about the Democrats they've found common cause with in the Trump era. Some veterans of the 2016 Trump campaign say privately that they are concerned that the president has squandered some of his advantage as an incumbent by waiting too long to get his campaign fully operational. The campaign raised $67 million in 2018 but spent nearly $56 million, and had little to show for it in terms of political infrastructure. Much of the money — in chunks as big as $3.4 million — went to companies with ties to campaign manager Brad Parscale, which raised eyebrows among Trump 2016 campaign alumni. But the operation has been quickly adding staff both at the national headquarters, where political and communications teams have been put in place, and in the states. The campaign has set a goal of activating two million volunteers for the election. And Trump himself already has dispensed with any pretense of a bulky legislative agenda for the next 18 months, as he speaks most frequently about his re-election themes both in stump speeches and at official White House events. The main difference between 2016 and 2020, Trump allies say, is that the president can run on his performance rather than just promises now — or, as he puts it, "promises made, promises kept." "We will run on President Trump's undeniable record of achievement for the American people: a booming economy, rising wages, groundbreaking trade deals, border security and a barrier along our southern border, a Constitution-abiding judiciary, America first on the world stage, the elimination of ISIS, criminal justice reform and President Trump's vision for making America even greater," McEnany said. Trump's eventual Democratic opponent — he'll have more than a year to sell the public on his record before they officially select a nominee — will surely take issue with items on that list and how they have played out for voters. For example, Trump's policies have hit farmers so hard in the wallet that the government has had to resort to subsidies to offset their losses from a trade war with China. Trump also has continued to talk about his effort to "drain the swamp" in Washington — a mantra aimed at explaining his efforts to take on the establishment of both parties to deliver results for the American public. "Probably the biggest area that the president will emphasize is what he's been able to do and what he's been able to do with the amount of obstruction he's faced in Washington, D.C.," said Rep. Mark Meadows, R-N.C., a top congressional ally of Trump's. "The swamp hasn't been drained and that will be a recurring theme in 2020 because there's still a lot of work there to do to drain the swamp and the swamp's fighting back." Democrats say Trump has made Washington more — not less — corrupt, pointing to the number of his close associates who have been convicted of crimes, including former national security adviser Michael Flynn and former top Trump campaign aides Paul Manafort and Rick Gates, as well as a sprawling set of investigations into various players and organizations in the Trump orbit, as evidence. Regardless of the specific fights, it's clear that Trump doesn't plan to change much about following the instincts that have thrilled his political supporters in hopes of creating a broader coalition. If anything, his recent policy moves — most notably his aggressive moves to try to begin building a border wall without congressional consent and his threats to seal ports of entry for lengthy stretches in the interim — show a rededication to appealing to the faithful. That may be a non-traditional path to a second term, but it follows the basic formula Trump used in 2016 — and, as Meadows notes, Trump now has a more sophisticated operation in place to try to pull it off. "He is light years ahead of where he was when he came down the escalator at Trump Tower" to announce his candidacy in 2015, Meadows said. "I fully expect that by July of this year it will be a well-oiled machine, similar to what you might expect of a traditional campaign, and yet he will do it in a non-traditional way. There is going to be nothing normal about the way this president campaigns."